Two instructors from the National Mountain Centre in Plas y Brenin have been helping prepare for a live show of nesting birds. Tim Neill and Adam Harmer abseiled down the remote cliffs at Mousetrap Zawn on Anglesey to survey the nesting location. 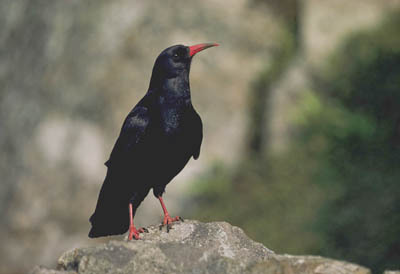 The site is home to breeding choughs, half of which can be found in Wales. A camera will be installed soon to provide visitors to the Royal Society for the Protection of Birds’ (RSPB) South Stack reserve with live images of nesting choughs. About four per cent of the species, a diminutive member of the crow family, nest on the reserve, on the north-west coast of the island. The area consists of heathland and sea stacks and caves and houses 4,000 seabirds in the summer. Among species to be seen are guillemots, razorbills and puffins. Click on the reserves link on the RSPB website for details of the South Stack reserve.